Why do we discontinue the auto-enroll process before the first day class? We stop the auto-enroll process in order to provide faculty with the most accurate roster on the first day of class. Faculty manage the enrollment for closed classes on the first day of class. We encourage faculty to prioritize the students on the waitlist for issuing permission numbers in classes with limited seats. How do waitlisted students use a permission number? Where can I see a list of my waitlisted students? When will permission number will be available to faculty? How many permission numbers will be assigned? Can I request more permission numbers? Yes, please email Silvia Cortez (scortez@peralta.edu) to request more permission number. The email should include Class Subject, Catalog Number, and Class Number. Where can I see my permission numbers? Do permission numbers override a course pre-requisite? Do permission numbers override holds on a student account? No. If student has any holds (Enrollment Services, Bursar’s Hold, Academic Standing, etc.) they must first clear their holds before using the permission number. Do permission numbers have an expiration date? Yes, permission numbers must be used on or before September 4, 2017. How can a student add a class after August 26? Students adding regular session classes after August 26 need to have a permission number. Will waitlist and permission numbers be available for dynamically dated classes (DYN)? Dynamically dated classes will have waitlists, but no permission numbers. Students will need to use an Add Card with the instructor’s signature to enroll in a DYN class after the last day to add for that particular class. The class units do not exceed your maximum allowed. When the daily process runs and space in the class is available, if you are on the waitlist but do not meet the criteria above, instead of being automatically enrolled in the class you will remain on the waitlist. Who gets into a class from a waitlist? If one seats become available, students will automatically be enrolled in the class in the order in which they were added to the waitlist as long as there are no errors or enrollment restrictions. If you are auto enrolled from the waitlist, you will be notified by email to your Peralta email account. Be sure to activate and monitor your Peralta emails during the registration period. Fees will be assessed after you enroll in a class and must be paid 2 weeks before the beginning of the term. If you do not pay your fees, you may be dropped from the class for non-payment. If you add after this deadline, you are required to pay the fees immediately or a hold WILL be placed on your account and your debt will be sent to collections. Students on a waitlist should monitor their Peralta email closely for enrollment notification. What is the first day I can waitlist? Waitlists become available when a class reaches its enrollment capacity. Waitlisted classes are displayed in the online schedule of classes with a yellow triangle icon. What is the last day I can be added to a waitlist? You can be added to a waitlist until the day before classes begin. What prevents me from adding to a waitlist? If an enrolled student drops a class and a seat opens up, do waitlisted students get the opportunity to enroll first? Yes. When a class is marked as closed only students from the waitlist can be enrolled. 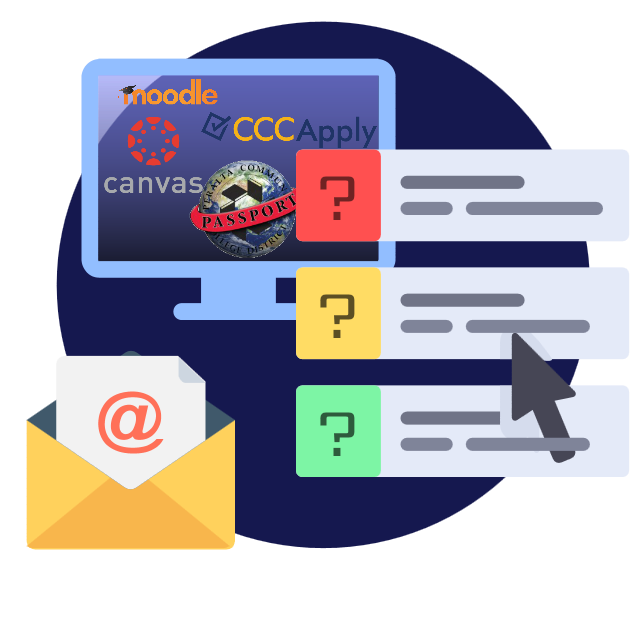 Before the first day of classes, a daily process runs to automatically enroll students from the waitlist. If all waitlisted students are successfully enrolled in the class and there are still seats available, the class will reopen. However, if all students from the waitlist are moved to the class filling the class to capacity, the class will remain closed and the waitlist will re-open. If by the first day of class you are still on the waitlist, you will need to attend the first class meeting and obtain a permission number from your instructor in order to enroll in the class. Can I be on the Waitlist for more than one section of the same class? Yes. You will be automatically enrolled in the section that becomes available first, depending on your position on the waitlist for each section. Yes, but they cannot be enrolled in both. A student can be enrolled in the open section of a class and at the same time be on the waitlist for a different section of that same class (maybe the waitlisted section was their first choice, but it has reached capacity). However, a student will not be auto enrolled in the waitlisted section when a seat becomes available, even if they are eligible. In this instance, they will need to drop themselves from the section they are currently enrolled. How will I move from the waitlist into the class? During the registration period before classes begin, you are automatically enrolled as space becomes available. After classes begin, instructors are required to issue permission numbers. You use the class permission number to enroll in the class via Passport (you must drop yourself from the waitlist before using the permission number) or by going to the Admissions and Records office at the college. Is there a limit to the number of units that can be waitlisted? Yes. Your waitlisted units and enrolled units cannot exceed 10 units in summer and 18 units in fall and spring. Are waitlisted units counted into my total units for the term? No. Enrolled units and waitlisted units are counted separately. Waitlisted courses are not counted towards full-time status or calculated for fees. Will I be charged the enrollment fee when I add to the waitlist? No. You are only charged the appropriate fees when you are officially enrolled in the class. Class Waitlists are available to instructors through class rosters. Yes. You can drop yourself from a Waitlist using Drop Classes in Passport. Can I see my position on a waitlist? You can view your Waitlist position in your Student Center under class schedule. How can I tell if a class has a waitlist? 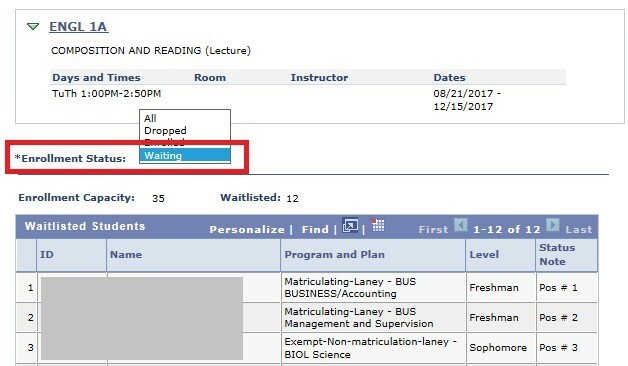 Waitlisted classed are marked by a yellow triangle in the online schedule of classes. During registration, if you try to register for a class that is full (CLOSED – Wait Listed), you will be given the option to add to the Wait List for that class until the Wait List fills. Remember, being on a Wait List does not guarantee you a seat in a class. If seats become available, those on the Wait List will be enrolled in the order they were added to the list. Important: Passport will allow you to get on a Wait List, however, you will not be enrolled if you have any holds, time conflicts, repeat or prerequisite errors, duplicate courses, excessive units, or any type of registration error.